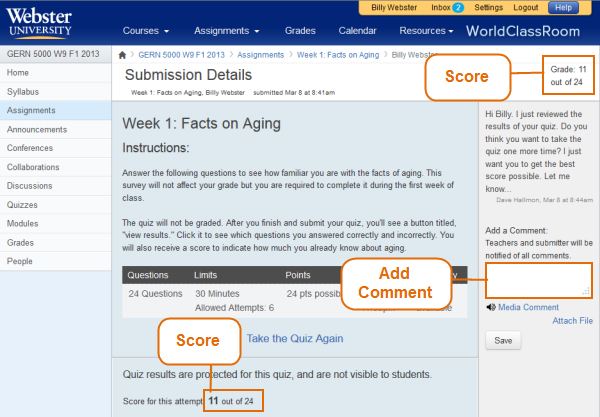 WorldClassRoom FAQs - How do I review my quiz results? How do I review my quiz results? All of your quizzes for your course can be seen from this tool. All of your quiz grades for a course can be seen from this tool. Quizzes that have been recently graded since your last access can be seen here. After a quiz has been graded, you will receive notification in your Grades tool and under Recent Feedback from the course homepage. You can also access the graded quiz directly by going to the Quizzes tool to view the grade and feedback. Note: The numbered notification for the Grades tool is only present during the next time a student accesses a course after the quiz has been graded. The same is true for Recent Feedback. 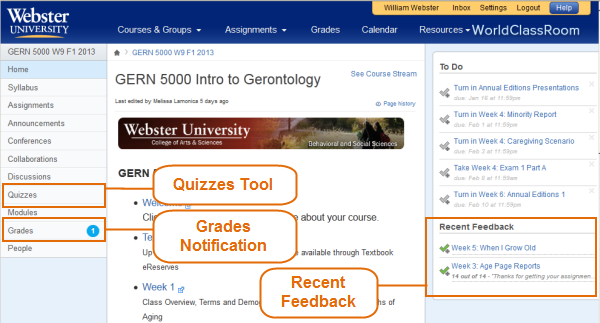 From within your WorldClassRoom course, click on the Quizzes tool in the Course Navigation menu on the left. From within the quizzes tool, you'll see a list of quizzes for the course. For quizzes that you have taken previously, the score will be listed on the right. Click on the quiz link for more options such as reviewing your answers (if they are made available) and or retaking the quiz. 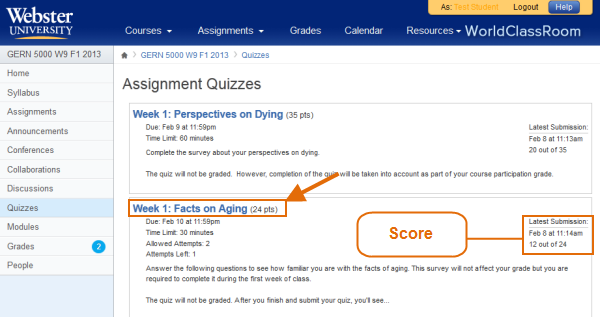 The graded quizzes may also be listed under the Grades tool in the Course Navigation menu. If you see a circle with a number in this location, this will indicate that something is newly graded. From within the Grades tool, quizzes will list a score earned next to the total points possible, e.g., 11 out of 24 as seen in the example below. By clicking on the Check Mark icon you can see your scoring details which will provide you with the most recent feedback from your instructor. Click on the quiz link for more options such as reviewing your answers (if they are made available) and or retaking the quiz. Hovering over a quiz listed in the Recent Feedback sidebar on the right side of your course homepage will provide you with a small popup containing information about your quiz submission. Here you will see at a glance if your instructor has made any comments and when it was graded. Click on the quiz link for more options such as reviewing your answers (if they are made available) and or retaking the quiz. As mentioned above, once a quiz is accessed there may be more options such as reviewing your answers (if they are made available) and or retaking the quiz. You can also discuss your results with your instructor by adding a comment on the right. If the results are available, you will see your submission below. There you may see your chosen answers, if it was a correct or incorrect, and perhaps what the correct answers were. How do I preview a quiz? How can I submit feedback about WorldClassRoom itself? How do I prevent cheating in quizzes?